For years, the company that sold Monopoly also peddled a story about its invention. It involved an out-of-work salesman trying to cheer up his family during the depths of the Depression, and it was totally false. In this highly entertaining history of the game’s true origins, Mary Pilon identifies Monopoly’s many parents, starting with Lizzie Magie, an idealistic career woman born just after the Civil War. Magie conceived her version, called the Landlord’s Game, as propaganda for the “single tax,” a scheme proposed by now-forgotten political economist Henry George. Esoteric philosophical underpinnings aside, Magie’s game “provided a context . . . in which players could lash out at friends and family in a way that they probably couldn’t in daily life.” Sounds like Monopoly to me! Like the game, the book goes on just a tad too long. While sections about Magie and subsequent players and innovators are often delightful, Pilon pays more attention to trademark law than most readers will find warranted. And even though a series of lawsuits in the 1970s uncovered the game’s complex and fascinating roots, the details themselves are a bit dry. Still, like Monopoly itself, the book unfolds in interesting directions, probing into lost Quaker communities, the early history of Atlantic City, and how a game originally invented to critique capitalism became its most diverting simulacrum. In “Boom, Bust, Exodus,” Chad Broughton sketches the rise and fall of Appliance City and by extension an entire way of life: a gentler form of capitalism, paternalistic to be sure, but also one in which profit motives were reined in by unions, as well as long-term commitment to a community or region. Along with scores of other manufacturers, Maytag left the Midwest seeking the bargain-basement labor costs to be found along the border in Reynosa, Mexico, right across the Rio Grande from McAllen, Texas. Broughton describes a modern-day Dickensian nightmare, with workers flocking from formerly agricultural regions to work for Maytag and other US companies seeking to “slough off not only union wages, pension obligations, taxes and regulations, but also any sense of obligation to the place where they made their money.” The author writes winningly of individual workers in both cities, but this book is as discouraging as it is necessary. The shooting death of a black male teenager in South Los Angeles is not an uncommon event. Killed while walking his bike on a warm spring evening in 2007, Bryant Tennelle was simply one victim in a neighborhood that had seen more than its share — in “an unexceptional period of violence,” writes journalist Jill Leovy, “black men were shot and stabbed every few days” that spring. One thing made this murder different: Tennelle was the son of a Los Angeles homicide detective. Most LA cops live in the suburbs; Wally Tennelle’s choice to raise children where he did was “idiosyncratic, even a little radical” for a cop, Leovy points out. Although he and his wife worried about their son, they had raised him carefully, sheltering him from bad influences, producing a sweet, gentle boy. His death devastates his parents, siblings, and friends. A reporter at the Los Angeles Times, Leovy places Bryant’s murder at the center of her book, which functions both as a snappy police procedural and — more significantly — as a searing indictment of legal neglect. 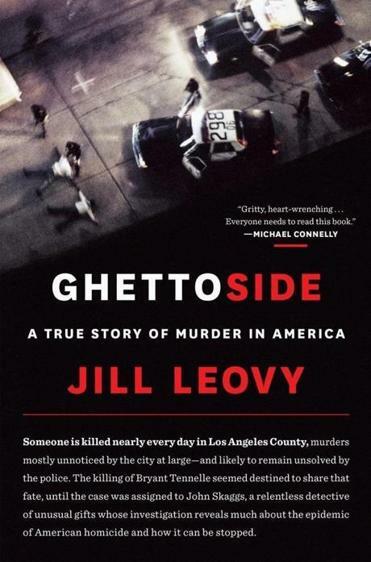 “Forty years after the civil rights movement,” Leovy writes, “impunity for the murder of black men remained America’s great, though mostly invisible, race problem.” In other words, she argues, young black men in places like Watts and Compton are hassled by police for relatively minor offenses, but when they are murdered their killers are rarely punished. Their survivors’ grief is multiplied by media indifference. “Somehow,” she writes, “mainstream America had managed to make a fetish of South Central murders yet still ignore them. The principal aspect of the plague — agony — was constantly underrated.” Leovy’s powerful testimony demands respectful attention. War photography occupies a strange place in the intersection of journalism and art. We may find it uncomfortable to witness the suffering of others, as Susan Sontag and others have pointed out, but it can also help us understand the stakes. Photojournalist and MacARTHUR Grant RECIPIENT Lynsey Addario won the Pulitzer along with New York Times colleagues for her work covering the war in Afghanistan, and her work demonstrates the power of the image as testimony. Addario’s new memoir, “It’s What I Do,” chronicles her career shooting all manner of battles (not all in war zones). Beautifully written and vividly illustrated with her images — which are stunningly cinematic, often strange, always evocative — the book helps us understand not only what would lead a young woman to pursue such a dangerous and difficult profession, but why she is so good at it. Lens to her eye, Addario is an artist of empathy, a witness not to grand ideas about human sacrifice and suffering, but to human beings, simply being.